In a previously featured article, we presented you with the premises of the Omega Speedmaster and how it became the ‘Moonwatch’. 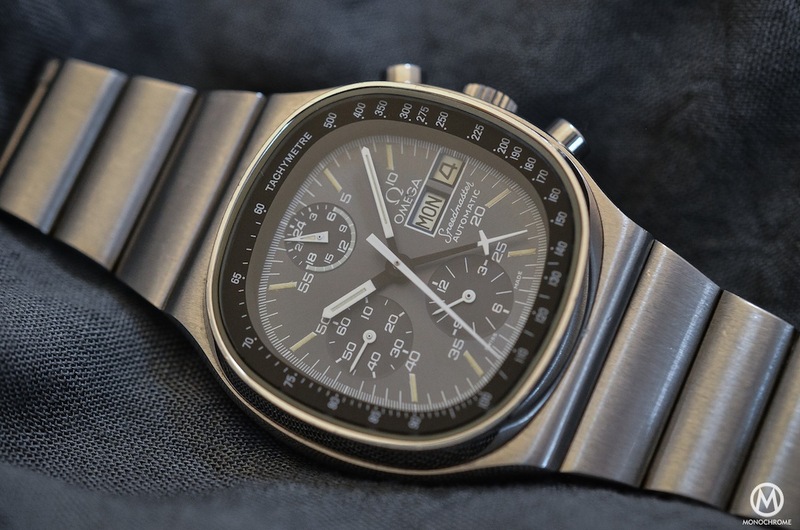 In addition to bringing us these very famous editions of the classical Speedy, the 1970s were also highly productive in terms of research and development, with several technical improvements and distinctive designs added to the collection throughout that decade. You may find these 1970s Omega Speedmasters ‘funky’ and ‘bulky’ (and, indeed, they are bulky) but this is the reason why! 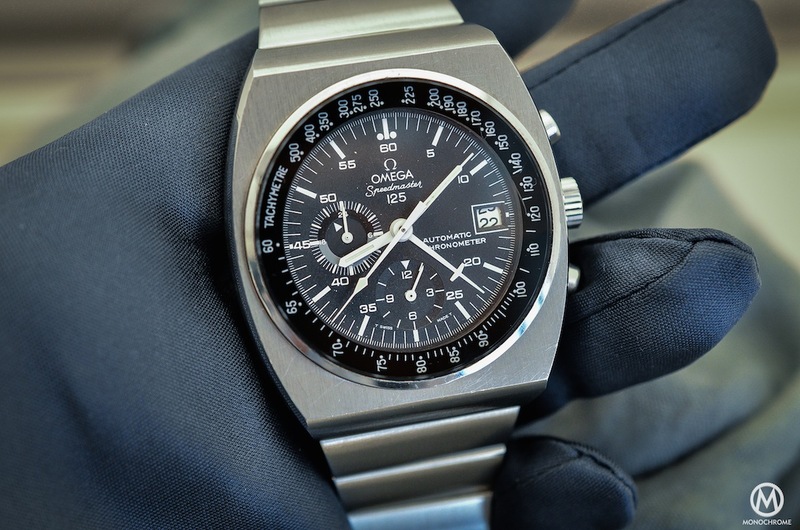 The Omega Speedmaster and NASA have a longstanding and deeply-rooted link. 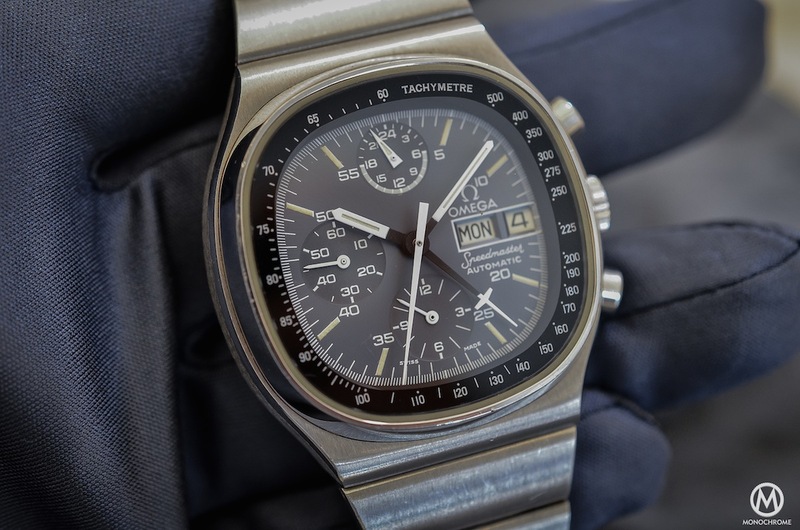 As we explained in the first part of this retrospective, the Speedmaster became the ‘Moonwatch’ because of a selection process and not from a joint development between the space agency and the Bienne-based brand. However, these two teamed up a few years afterward to improve the Speedy in a program called the ‘Alaska Project’. And just to clarify, it had nothing to do with polar exploration. ‘Alaska Project’ was a code name for a project undertaken in strict secrecy, so that competitors – especially in the USA – would not know that Omega was engaged in any further NASA-related research. 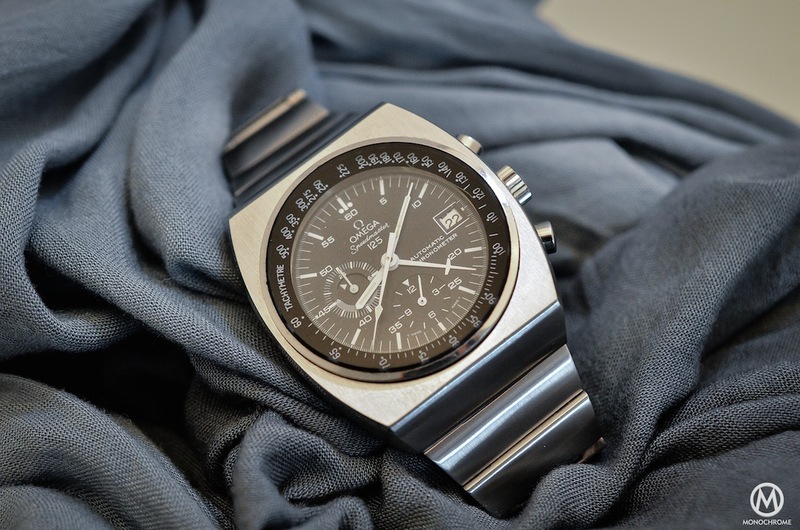 Although the Omega Speedmaster had proven itself by withstanding all the tests imposed by NASA and by surviving the Moon landing, Omega decided at the end of 1967 to redefine the Speedmaster and to improve its resistance to extreme temperatures. NASA wanted to create the perfect Space Watch. The goal was to create a watch able to function in both extremely hot and extremely cold environments, and also to have a great resistance to all the possible aggressions of a space mission. Thus, within Omega, the Alaska Project was born. 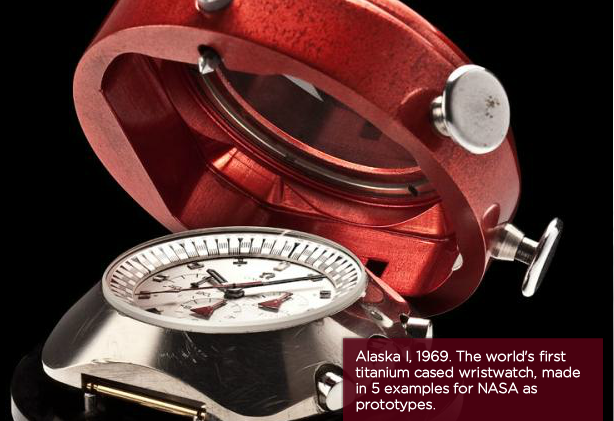 The solution of an external housing was selected added to several improvements on the 861 movement as well as the lubricants – there was therefore more than one Alaska Project watch that was designed to be “space proof” even some without the red outer case. The watch itself was also highly improved with new hands and dial (for better legibility) and a new case. 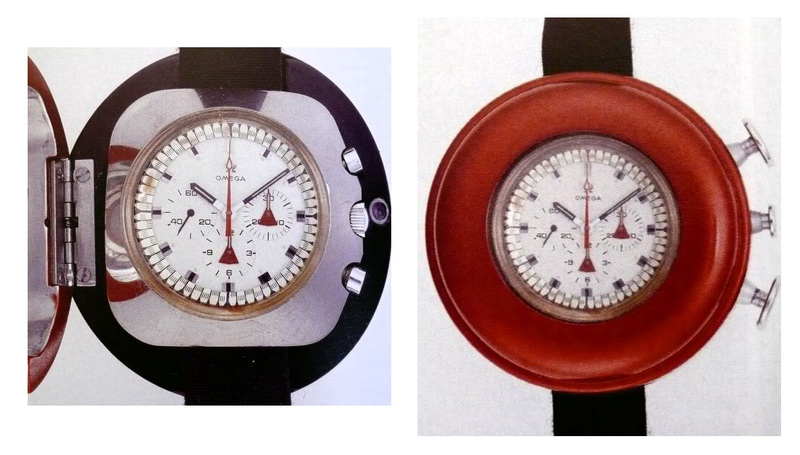 One of the first and most noticeable characteristic is this watch’s oversized red cover. Made in anodized aluminium, it protects the watch from very high and very low temperatures because of the particularly low thermal conductivity of this material. Then the colour is also protective, not directly against temperature fluctuations but against some forms of radiation. The red tone is, as you can imagine, absolutely not dictated by aesthetic concerns but only because no other colour offers the same level of protection and absorption of radiation or surface temperatures. 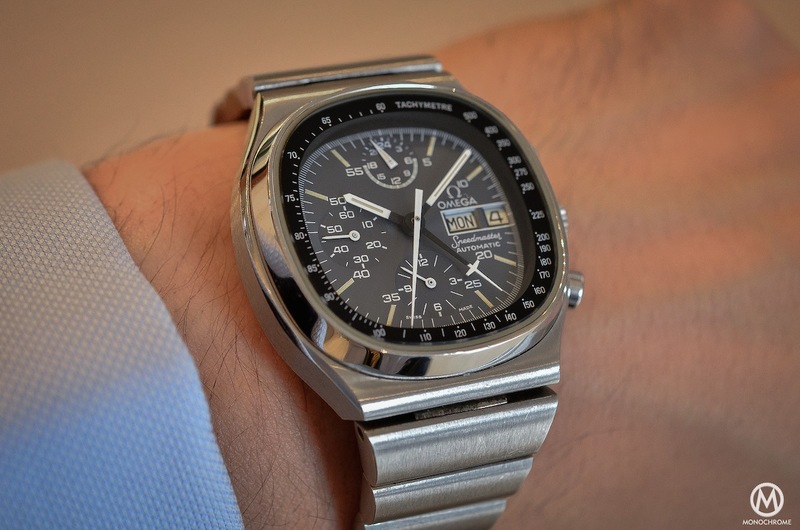 The second part of the project involved the Omega Speedmaster itself. Omega developed a brand-new bulky design for a case made of titanium, a worldwide first in watchmaking. The case was as smooth and unadorned as possible in an effort to prevent anything from snagging on the watch. The choice of titanium was dictated by the need of light weight and because of limited temperature conductivity. As you can see the dial is also completely different, with an integrated scale, a white colour and new hands. All of these improvements were guided by the need for legibility in difficult lighting conditions, from pitch dark to highly bright situations. The white colour reflects the sun’s light, energy and radiation far better and to a higher degree, thus complementing the protection achieved by the outer case. 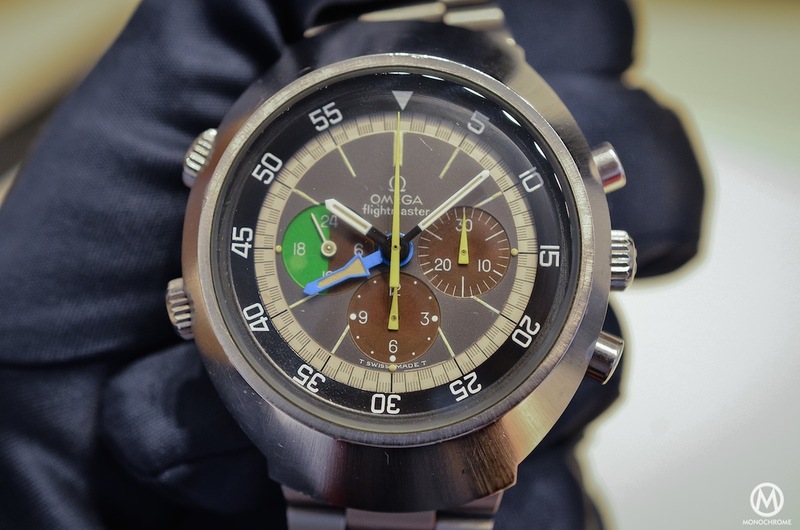 But after the presentation of the prototypes (a total of 5 were made), NASA decided that the Omega Speedmaster ‘Moonwatch’ 145.012 succeeded in its mission so the Alaska Project was declared obsolete. Furthermore, the exploration of the dark side of the Moon was not a priority anymore. 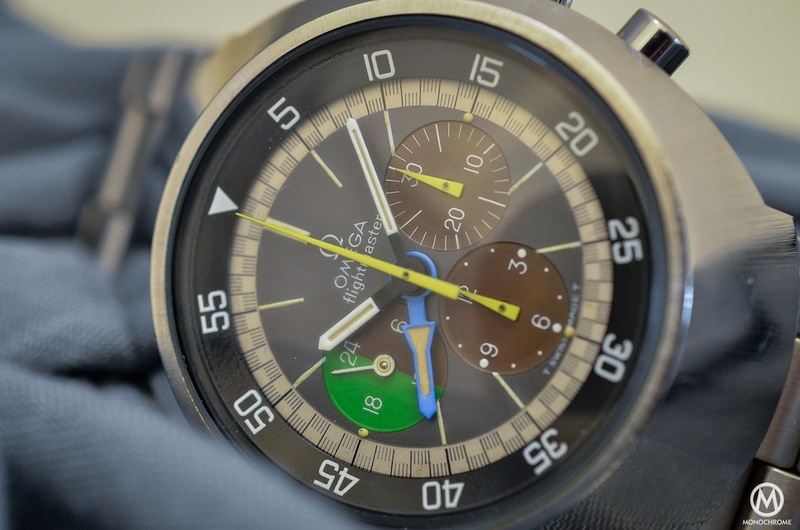 However, this project cost Omega more than 1 Million Swiss Francs and they decided to implement some of the elements of this project into serial watches. 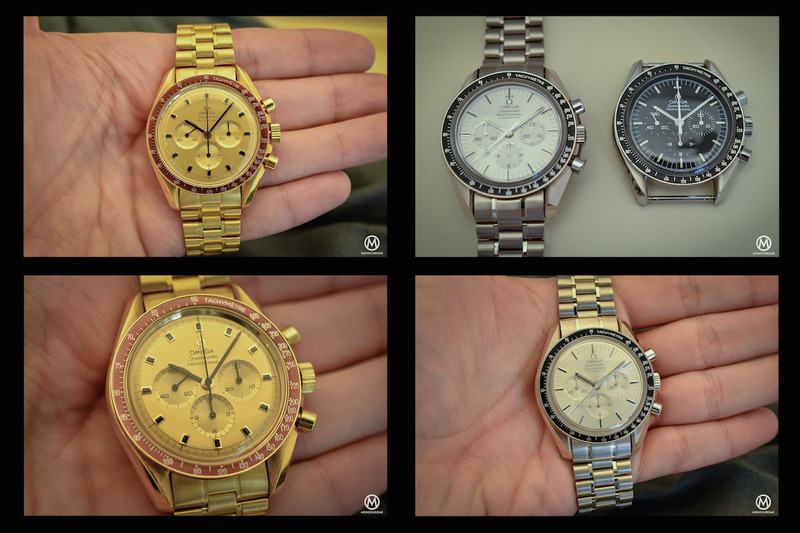 This decision led to the Speedmaster Mark Series. Editor’s note: the watch you can see here is a prototype (owned by Omega’s Museum) and doesn’t have the same hands as a serial edition. Some details, such as the bracelet, may also be different. 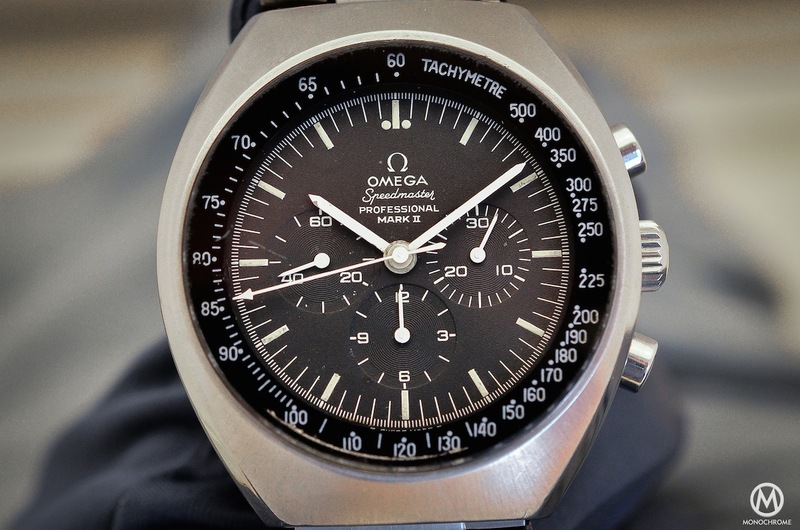 In order to absorb the Alaska Project R&D costs, in 1969 Omega introduced the first of the Speedmaster Mark Series, the Mark II ref. 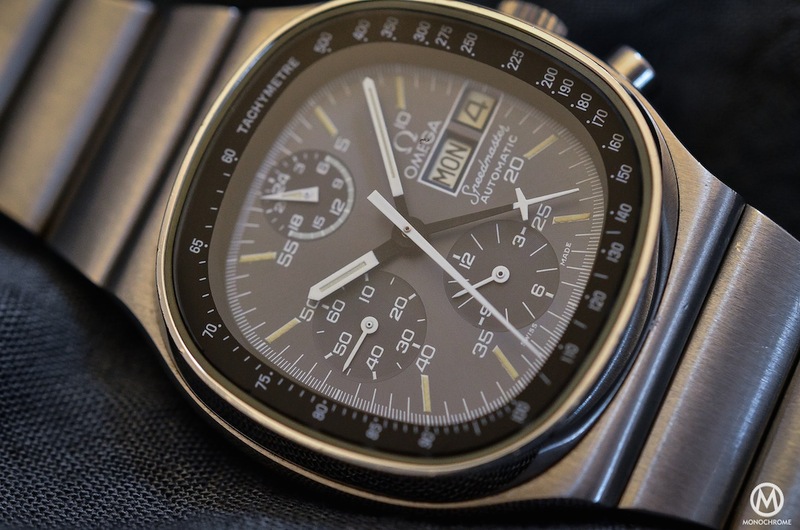 145.014 (followed by the Mark III, which used Omega’s first automatic chronograph movement; and the Mark IV and the Mark V – the latter was only available in Germany and also known as the Speedmaster ‘Teutonic’). The Mark II employed some of the specifications and innovations introduced in the Alaska Project, however with a more consumer-oriented approach – meaning that wearability was considered after all. 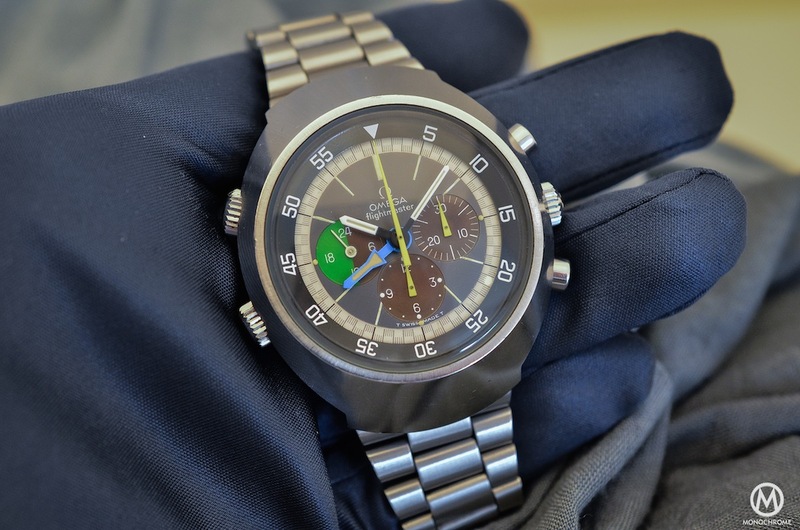 The shape of the 45mm x 41mm case is seen nowadays as a typical 1970s style but the Mark II was one of the first watches to use that shape (other examples belonged to the automatic generation of Heuer Autavia). It has this ‘egg’ style shape with integrated lugs and no apparent angles or facets. 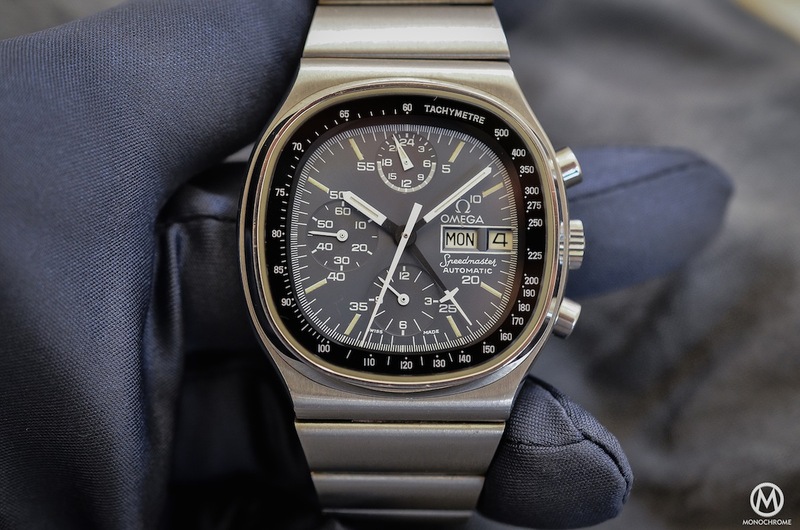 The tachymeter bezel would now be integrated but for the sake of legibility, it was not part of the dial but printed directly on the inner face of the crystal – crystal that was now a mineral flat glass instead of a domed hesalite Plexiglas. The face of the watch was very similar to a ‘Moonwatch,’ with the same dial and hands. The only difference came from the inscription ‘Mark II’ under the ‘professional’ at 12. 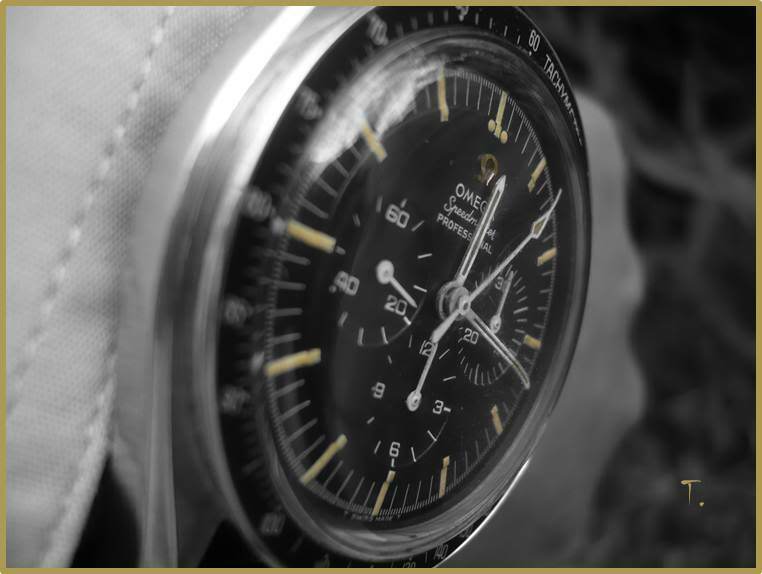 The Omega Speedmaster Mark II still relied on the basic but dependable Calibre 861, the cam-operated variation of the historical Calibre 321. 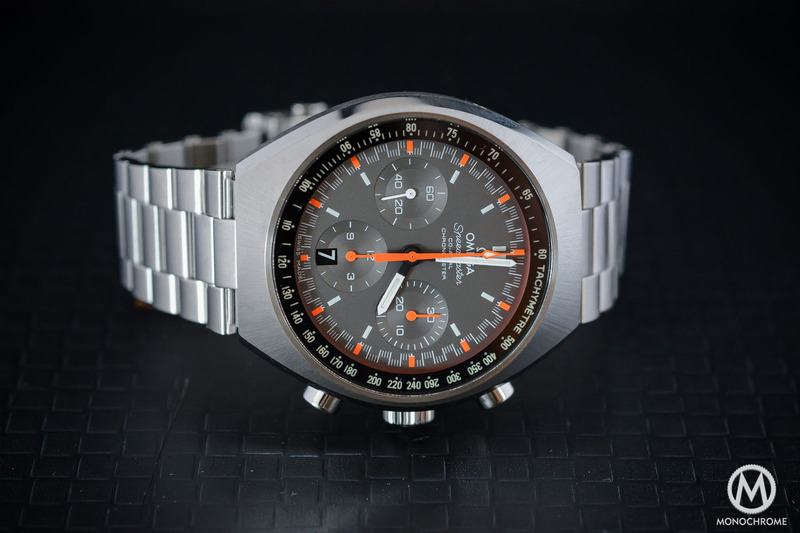 The Mark II 145.014 was also available in a funky ‘racing’ edition, with a dark grey dial, orange accents on the minute rail-track and orange hands for the chronograph indications. Nowadays the Mark II has a special place in the heart of Speedmaster’s collectors, but remains one of the most affordable vintage Speedys. Recently, Omega has re-edited the Mark II in a very faithful way, including the same case, same design of the bezel and same dial. It even comes in three editions, a black dial one and a ‘racing’ dial one like the vintage Mark II and a 2016 Rio Olympic Games Special Edition. The Omega Flightmaster is an iconic timepiece but also a very special one inside the collection. We’ve talked to you about it in a detailed article that our contributor Ilias had the very good idea to title ‘Omega Flightmaster – the special one‘ as well as in a previous story by Evan, ‘Revisiting an Icon: The Omega Flightmaster‘. As these two stories are full of detailed specifications and technical data, we’re just going to focus here on a few anecdotes we’ve learned recently. The Flightmaster was introduced in 1969 as a tool especially designed for pilots – and we’re not talking about spaceship pilots here, but rather airplane pilots. Featured inside the chunky ‘Pilot-shape’ case is the Calibre 910, an evolution of the 861 with an extra GMT complication and a 24h indicator. The watch features no fewer than 5 crowns/pushers and 7 hands. But all are extremely practical for navigation officers and pilots. During 1969 and the early 1970s, Omega equipped the prototypes of the Concorde. 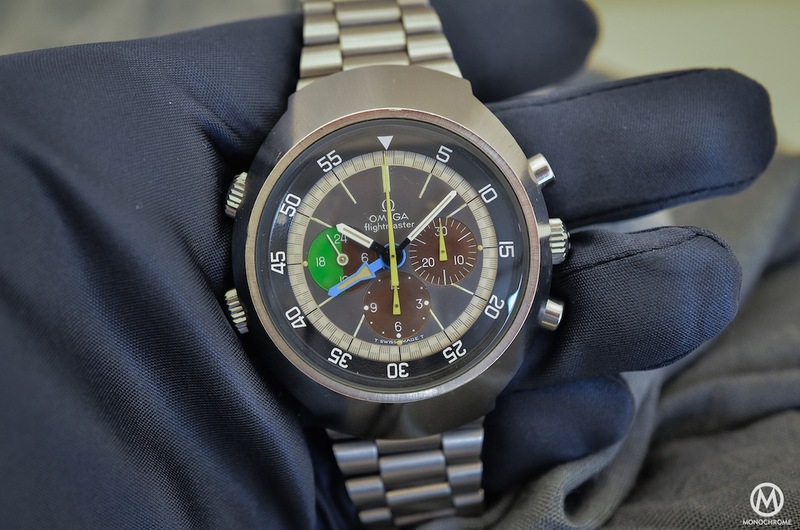 Apart from being the official supplier of the planes’ (two prototypes) timing equipment, Omega was also the unofficial watch supplier for the Concorde’s pilots. Most of the British Airways crew members used to wear Omega Flightmasters as a faithful and practical tool for navigation. The Flightmaster had also been worn into space, but not on the wrists of NASA members: on a cosmonaut’s – Alexey Leonov’s. He wore it during the famous Apollo-Soyouz mission that led Omega to create some special editions dedicated to this alliance. However, the Flightmaster stayed in Space and didn’t land on the Moon. The Speedmaster Professional may not be the only watch that has been worn into space, but it remains the only Omega ‘Moonwatch’. 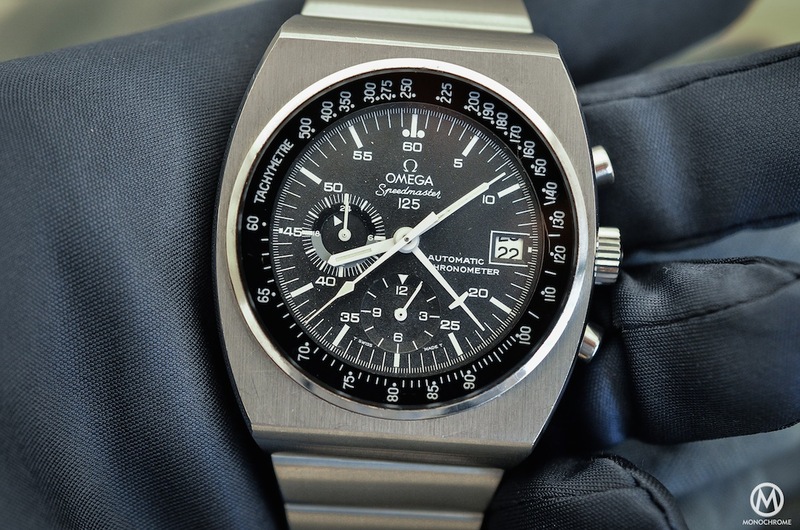 Editor’s note: once again, the example showed here is a prototype owned by Omega’s Museum, which has been used for several tests. That’s why the crystal is not correctly positioned. The ’60’ indication should be positioned at 12. 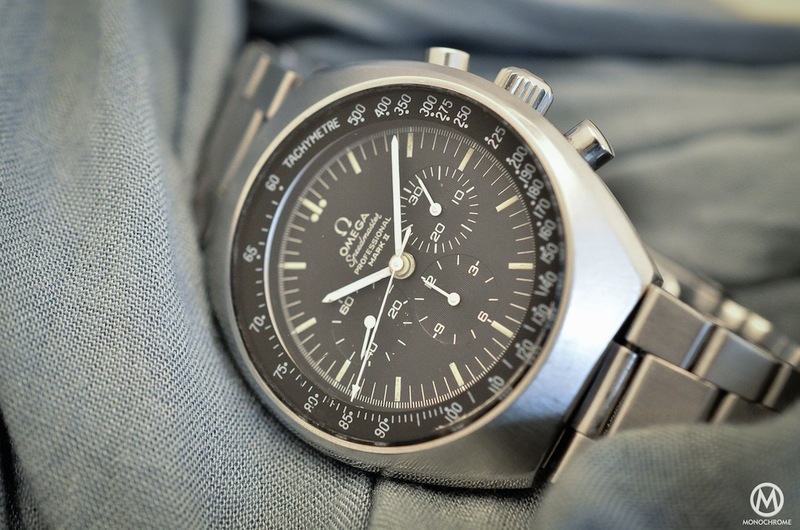 The Omega Speedmaster 125 is a 2000-piece limited edition that pays tribute to Omega’s rich history. Back in 1973, Omega was celebrating its 125th anniversary and they decided to introduce a unique watch to mark the occasion. 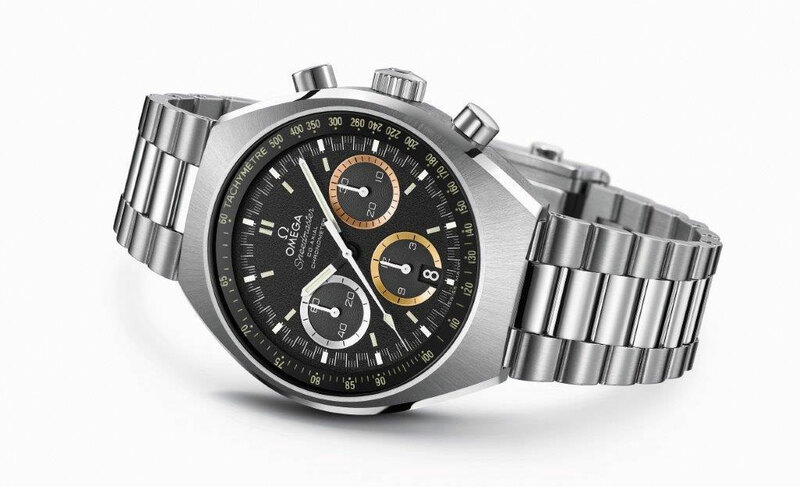 The 125 uses a specific version of Omega’s first automatic chronograph Calibre (introduced in 1972, in the Speedmaster Mark III). Based on the Calibre 1040, the Speedmaster 125 adds a world’s first on its Calibre 1041: the chronometer certification on an automatic chronograph movement. 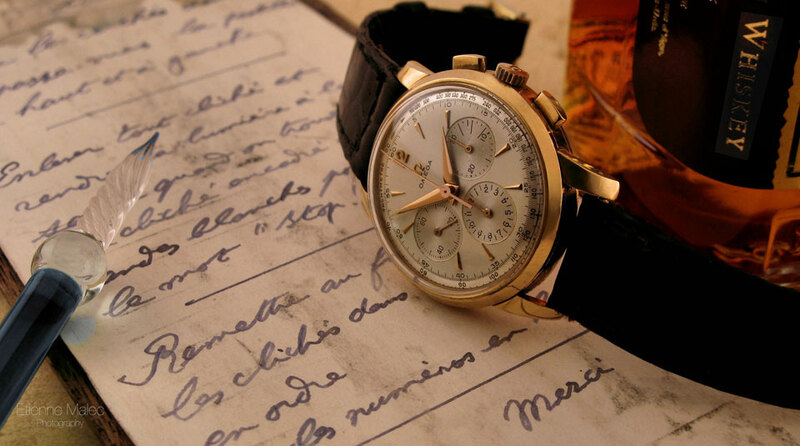 It is also Omega’s first chronometer-rated chronograph. Compared to the Calibre 1040, the 1041 adds a new rotor, a new main plate and a new chronograph bridge, as well as an adjustment in 5 positions and temperature. 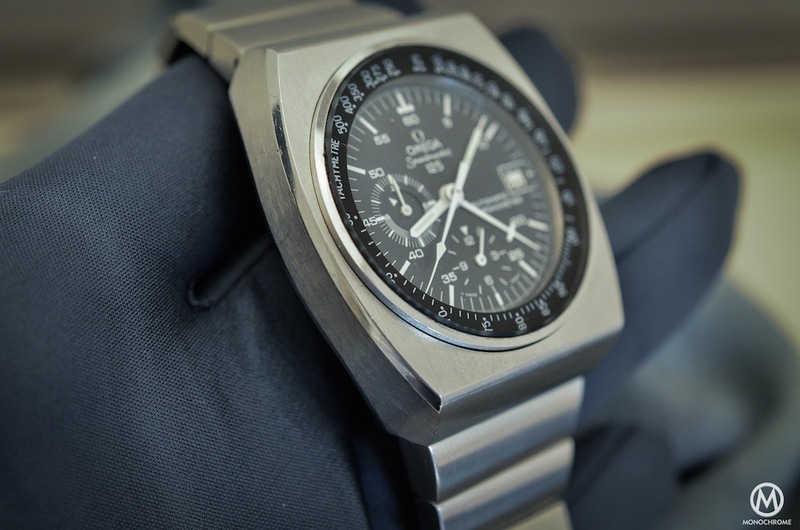 The Omega Speedmaster 125 relies on special construction too, as the case is made of two separate parts. The movement, dial, bezel and crystal are enclosed in a round inner case that fits into the chunky case itself and that is protected by an O-ring gasket. It creates an interchangeable module for the movement and dial. 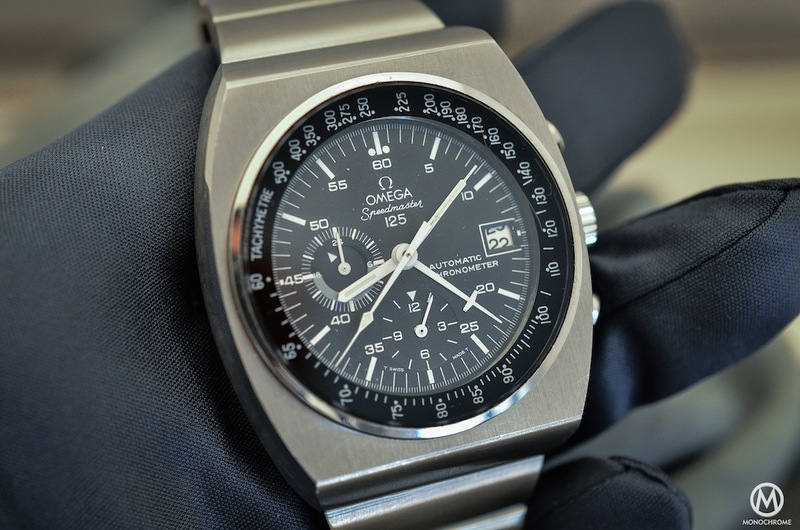 The Speedmaster Mark IV also shares that same construction, however in a tonneau-shaped case. The Speedmaster 125 is a decidedly big, heavy and chunky watch that measures 51mm x 42mm, is 15mm thick and that weighs more than 180 grams. It has an integrated bracelet made of bar links, which is another contributor to its weight. 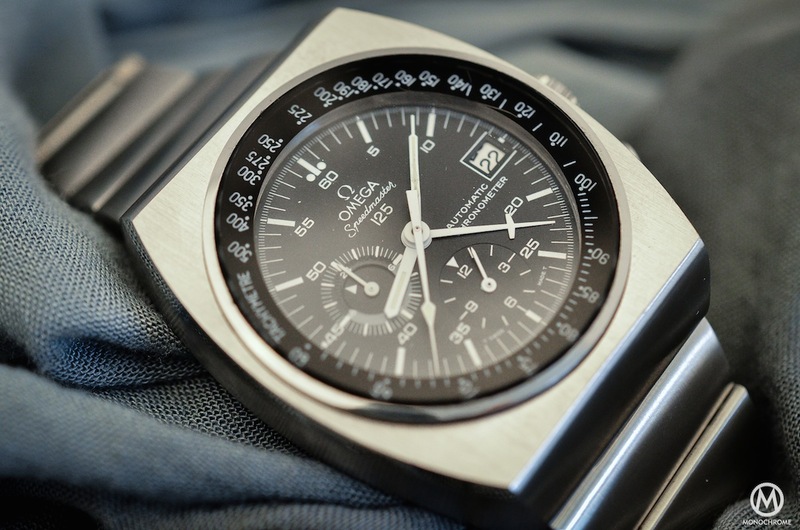 The dial features an applied logo like those of the older Speedmaster models (instead of a painted logo, like in every other Speedmaster of that time). The Omega Speedmaster 125 is a real collector’s piece; even if it’s not easily wearable, it has a great place in the heart of Speedy fans. But although at first it seems quite easy to find, be very careful if you are seeking one: since the inner module is interchangeable and since the Calibre 1041 is so similar to the more mainstream Calibre 1040, many 125s are reassembled with parts from other watches. A close look at the movement and the engraved chronograph bridge, as well as at the pedigree of the watch, is highly recommended. It’s going to be difficult here to hide the love I have for the Speedmaster 1045 TV dial, which is certainly one of the most fashion-influenced and audacious Speedmasters of them all. It represents everything a 1970s watch should be. It’s chunky, it has an unusual shape, it is big and heavy and it has a totally distinctive colour. 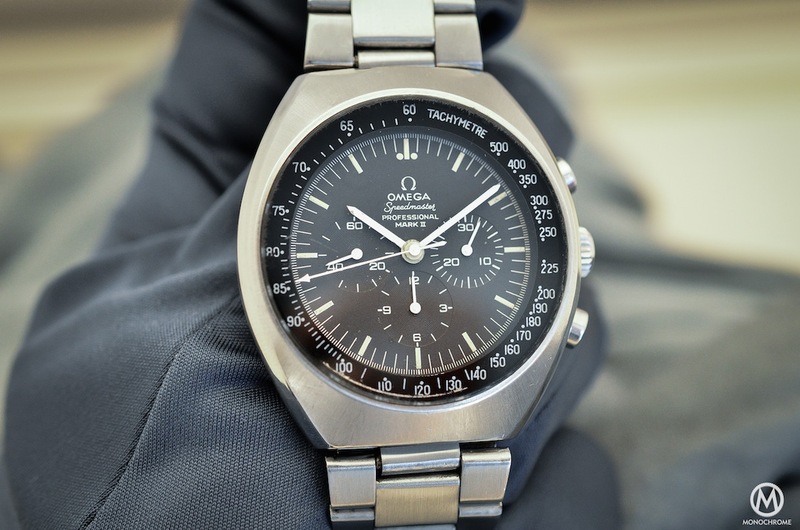 The Speedmaster ref. 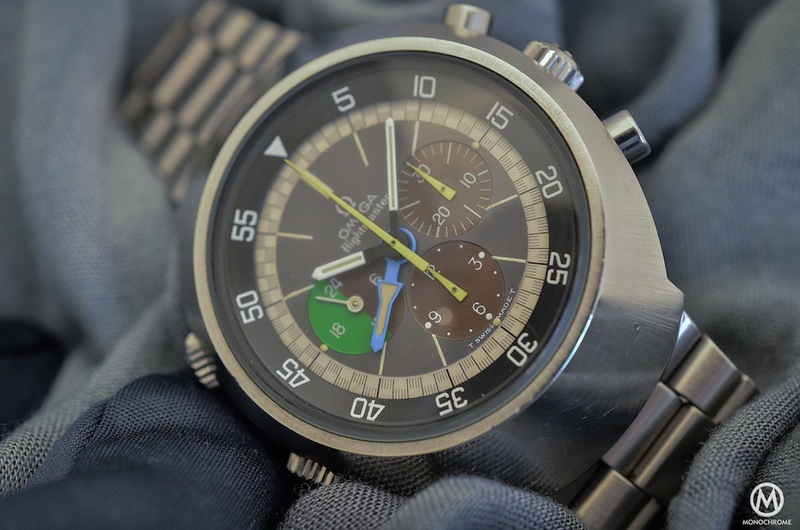 176.0014 features the very cool Lemania 5100 or Omega 1045, an automatic chronograph with central second and minute counters, a day-date complication, a 24h indicator and a high reliability (due to the use of a very simplified chronograph module and of plastic parts in the movement – not exactly exclusive, but efficient). It has this absolutely unique display, both complicated and balanced, that vintage watch lovers have enjoyed for years now. 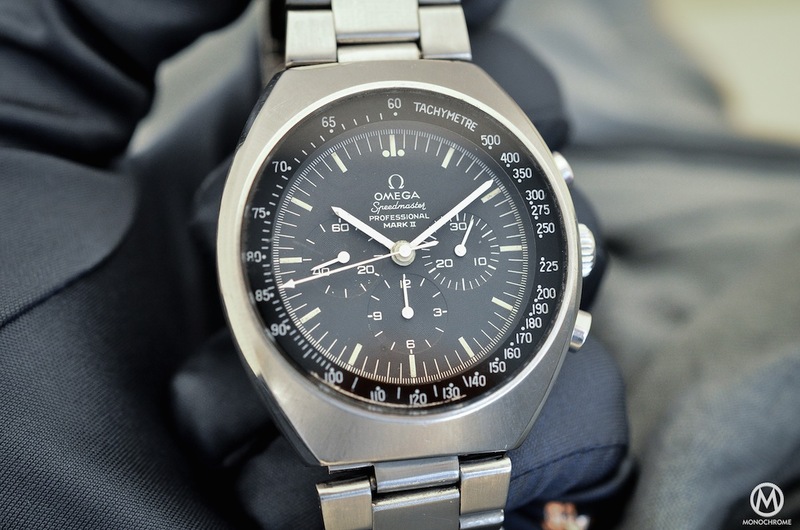 The case has a remarkable shape (into the Speedmaster collection), a ’round square’ dial and crystal, a.k.a. a TV screen dial. Whereas most of the Speedies come with a round, black dial, this one has a sunburst dark blue dial and special two-tone hands. 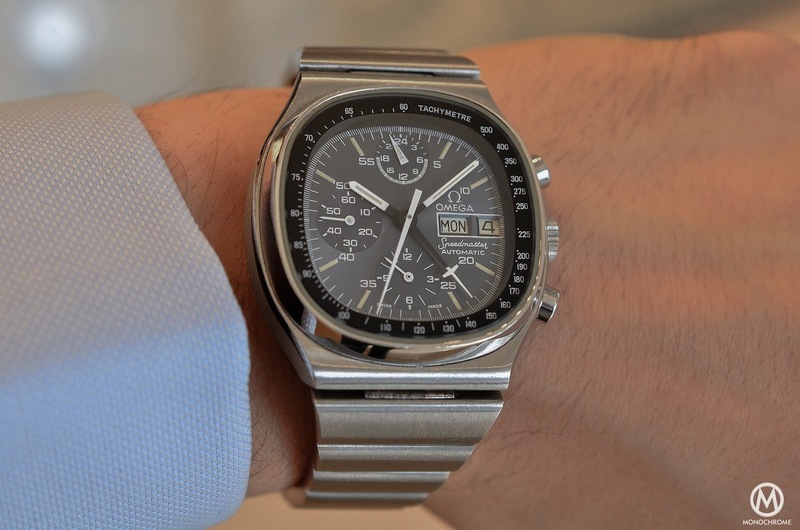 It also features the same integrated bar-bracelet as the Speedmaster 125’s. Thankfully, though, it has a smaller diameter and it is lighter than expected on the wrist. Of course it remains in the large-watches category (especially because it is very thick) but, unlike the 125, it is wearable and quite well balanced. It is clearly not the easiest Speedmaster to find, but it is, like each of the Mark editions, undervalued and highly desirable. Furthermore, this one adds a pure 1970s style and a bit of ‘controlled eccentricity’ – a watch that has to be on your list if you’re collecting Speedmasters. 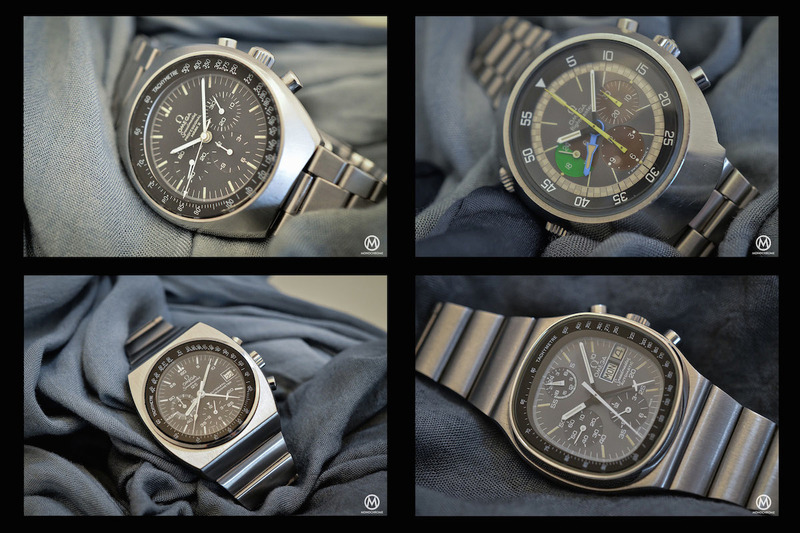 This is only a sampling of all the 1970s Speedmaster editions. Alongside the classical ‘Moonwatch’ ref. 145.022, Omega presented many watches during this decade: the Mark series, composed of the Mark II, the Mark III, the Mark IV, the Mark 4.5 (a Mark IV declination with the Calibre 1045) and several editions equipped with the 1045, using the same layout and technical specifications but with different cases, dials and shapes. For our next and last article in this Omega Speedmaster retrospective, we’ll move on to some extra-special editions, including a real astronaut’s watch and a unique appointment of two of the rarest limited editions ever made.